You might associate skateboarding with teenagers flying around the neighborhood skatepark. However, a growing number of people use skateboards for a more utilitarian purpose: travel. Skateboards are part of the suite of human-powered sustainable travel modes and a relatively popular form of mobility for younger people. Travel surveys, from which we understand how, where, and how much people travel, often do not list skateboarding as a travel mode. But those that do have measured notable amounts of skateboard travel. In Los Angeles, transit riders use skateboards 30,000 times each day to get to and from bus stops and train stations. Observers in Portland, Oregon, found that at least one skateboarder passed through 79 percent of intersections. At one intersection, they counted 17 skateboarders — about one every seven minutes. Skateboard commuters, and data about skateboard commuters, are particularly prevalent at college campuses. In 2016, skateboarding slightly eclipsed driving alone rates to campus among students at UC Santa Barbara, 8 percent versus 7 percent. At San Jose State University, skateboard commuting has increased by 3,500 percent since 2005. Skateboarders now outnumber motorcyclists — considered to be much more conventional travelers — by more than two-to-one. At Arizona State University, approximately 4 percent of students skate for intra-campus trips. In observations at San Diego State University, skateboarders made up 6 percent of people on one pathway despite the activity being illegal at the time. The California Household Travel Survey found that 0.14 percent of all daily trips in California are taken on skateboards and similar devices. While that may seem small at first glance, it corresponds to nearly 50 million miles traveled per year when the percentage is multiplied by the population of California, the number of trips people make, and an average trip length for skateboards and similar devices of about three-quarters of a mile. Over those millions of miles, skateboarders likely have hundreds of millions of encounters, interactions, and potential conflicts with other travelers. The current popularity of skateboard travel appears to be at least partially an echo of the boom in recreational skateboarding seen in the 1990s and early 2000s. At the peak between 2003 and 2005, there were an estimated 13 million skateboarders in the United States. Whether or not those individuals still skate, that experience means a significant number of people have the skill to ride. Skill matters: Surveys of skateboard commuters at UC Davis found that most began skateboarding initially for recreation as teenagers or pre-teens. There are also indications of growing adoption of skateboard travel by those without past experience, particularly among women. A majority of female skateboarders at UC Davis reported less than two years of skateboarding experience while the majority of skateboarders as a whole had more than four years of previous experience. Our research at UC Davis, which included in-depth interviews with skateboard commuters, questions in the annual campus travel survey, and general observations of skateboarders, suggests skateboard commuters enjoy skateboarding more than other types of travelers typically enjoy their modes. 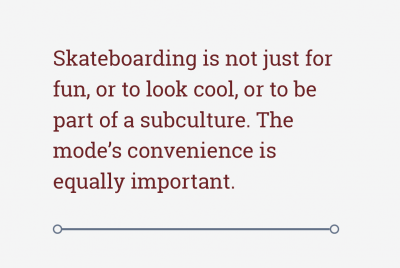 However, skateboarding is not just for fun, or to look cool, or to be part of a subculture. The mode’s convenience is equally important. This convenience manifests itself in different ways. 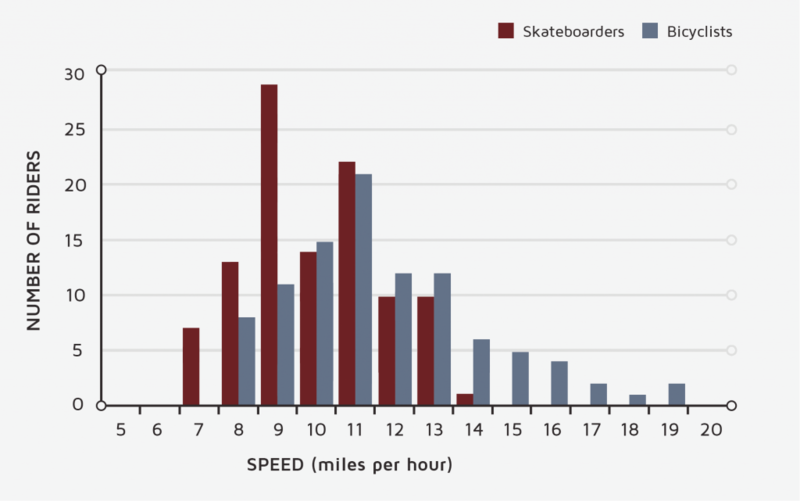 Skateboarding is clearly faster than walking: Our observations at UC Davis found that skateboarders travel between 6 and 13 miles per hour, with an average of 9.7 miles per hour. At two- to four-times the speed of walking, skateboards can extend the range of destinations reachable under human power. Bicycles, of course, can provide that same benefit, at even greater speeds. But skateboarders are closer in speed than one might think. Bicyclists on the same facility traveled between 6 and 19 miles per hour, with an average of 11.6 miles per hour. Most skateboarders are faster than at least some bicyclists. And while on average bicyclists are about two miles per hour faster than skateboarders, other conveniences of skateboarding can counter that advantage. Riders can easily carry their skateboards when not in use, allowing skateboarders to travel from door to door like pedestrians and take their skateboards inside their destinations. Skateboarders don’t have to spend time diverting to bicycle parking racks, securing their locks, walking to their destination, and repeating the process when they leave. On relatively short trips, avoiding this routine can make up, at least in part, for the slower speed of skateboarding. The ability to carry skateboards easily also makes them convenient for multimodal trips. 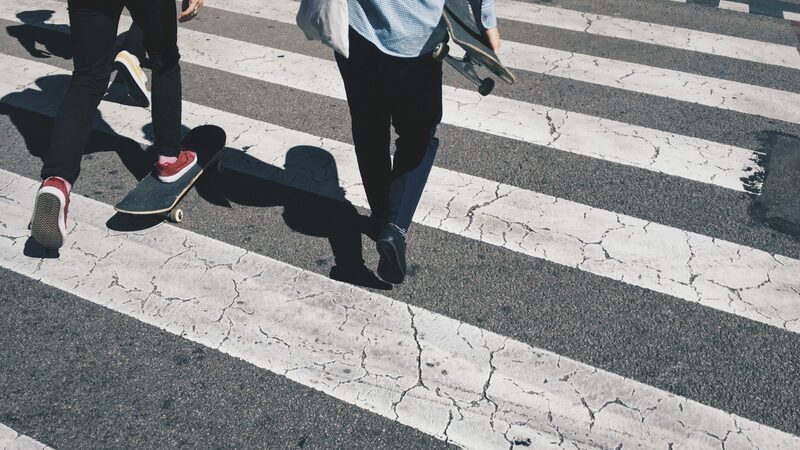 Data from Los Angeles and some college campuses show that many skateboarders use their boards in combination with other modes rather than for entire trips. A rider can easily carry a skateboard onto a transit vehicle or car. Skateboarders need not worry about the availability of limited bicycle racks on the front of a bus or in a train, or prohibitions of bicycles on some transit systems during rush hours. Skateboards also generally cost less than bicycles, with premium skateboards typically selling for a few hundred dollars, similar to low-to-mid-range bicycles. Skateboards can also have an advantage in terms of maintenance cost – they don’t get flat tires and have relatively few parts. Additionally, the ability to carry skateboards into destinations allow skateboarders to avoid one of the primary downsides of bicycling: the potential for theft. In our interviews with skateboarders, we found that stolen bicycles were a common catalyst for a shift to skateboard travel. The decision to travel via skateboard is not always a legal one. In California, about 90 percent of cities regulate skateboarding in some way, and most regulations either overtly or implicitly respond to negative perceptions of recreational skateboarding — that it is unsafe, damaging to property, noisy, or caters to an unseemly class of people. One California city goes so far as to call skateboarders “aggressive and abusive to the elderly” in its municipal code. Some cities regulate what they consider undesirable skateboarding through restrictions on doing tricks or interacting with street furniture. This approach does not affect well-behaved travelers. However, jurisdictions more commonly prohibit skateboarding in various places or situations necessary for travel. Skateboarding is often prohibited on streets, on sidewalks, in business districts or other parts of a city, and at night. Such prohibitions can make skateboard travel to many destinations illegal in ways that travel using other modes are not. While not necessarily the target of regulations, skateboard travelers end up being restricted as a result. Skateboard travelers often sit in a legal black hole, restricted by regulations even as regulators rarely recognize their mode of travel. Yet even in places where policymakers know that skateboards are used for travel, they commonly justify prohibitions out of concern that skateboard travelers could be injured or injure other people. While concern for safety is certainly understandable, blanket prohibitions are not how governments regulate any other mode of travel. 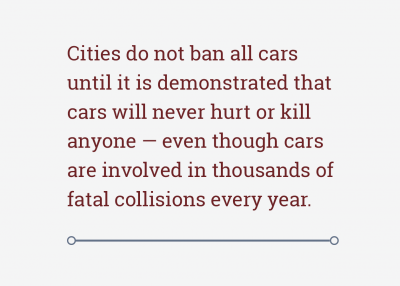 Cities do not ban all cars, for example, until it is demonstrated that cars will never hurt or kill anyone — even though cars are involved in thousands of fatal collisions every year. How serious are safety concerns? Are regulations that restrict skateboarding in the interest of safety justified? Many perceive recreational skateboarding as an “extreme sport” and thus dangerous. California’s healthy and safety code even defines skateboarding as a “hazardous recreational activity,” although this counterintuitively enables recreational skateboarding by limiting civil liability in public skateparks. Fears that skateboard travelers engage in dangerous tricks that could injure bystanders appear to be unfounded. Our observations found that skateboard travelers almost always move forward in simple straight lines while they travel. Most ride “longboards” or other variants designed for cruising, which makes tricks difficult if not impossible. Only about one-quarter of skateboarders we observed on the UC Davis campus ride the same type of skateboards used in recreational trick riding. Even those riding trick skateboards often make modifications, such as installing larger and softer wheels, that facilitate cruising at the expense of performing tricks. At least 147 skateboarders were killed in the United States between 2011 and 2015. Only one fatality occurred at a skate park; virtually all the rest were on transportation facilities, and three-quarters involved motor vehicle collisions. While we were not always able to ascertain the purpose of these fatal trips, in those where the purpose was clear, almost two-thirds of victims were traveling rather than recreating. While these fatalities are certainly tragic, on the whole, skateboard travel does not appear to be unusually dangerous. In California in 2012, people on all modes experienced 1.4 fatalities per 10 million trips. Skateboarders and scooter riders (similarly classified and not separable in data) experienced 1.6 fatalities per 10 million trips, just below bicyclists at 1.7 fatalities. Per distance traveled, non-motorized travelers experienced 22.6 fatalities per 100 million miles traveled. Skateboarders and scooter riders experienced between 20.9 and 23.0 fatalities. Regulations that prohibit skateboard travel because of negative perceptions of recreational skateboarding, or that hold skateboarders to higher standards than other travelers, raise fundamental questions of fairness. How can cities respect skateboarders’ freedom of choice while balancing other facility management concerns? In some states like California, skateboarders fit under the state vehicle code definition of a pedestrian, which includes people on human-powered devices other than bicycles. That gives skateboarders at least a default legal standing. For example, drivers should yield to skateboarders in crosswalks since they are pedestrians, too. However, it also means that a skateboarder traveling along a road can be cited as a pedestrian outside a crosswalk, as happened to one person we interviewed. Other states, such as Oregon, define pedestrians more narrowly as people who are “afoot.” This definition makes the relationship between skateboarders and other users much murkier. A starting point may be to ask, where should skateboarders ride? Given that skateboarders travel in a similar range of speeds as bicyclists, bike facilities seem like a reasonable choice, and our surveys of skateboarders find that they are very comfortable in such facilities. Since skateboarders are slower than bicyclists on average, bicyclists may not be that enthused about sharing space with slower travelers. But efforts to increase rates of bicycling often seek to encourage new, less-skilled, or less confident bicyclists to ride more, and these groups are likely slower than current bicyclists, too. Adding skateboarders to bike paths might not be all that different than adding new bicyclists. And on shared-use paths, skateboarders are at least as compatible with pedestrians as bicyclists given their comparable speeds. In the majority of locations without bicycle facilities, human-powered travel is primarily limited to roads and sidewalks. Quiet neighborhood streets with little vehicle traffic would present few conflicts for skateboarders. In city centers, skateboarders might share roads with more vehicle traffic, but flowing at low speeds. Sidewalks in those same city centers may be problematic given limited room to maneuver and the possibility of conflicts with numerous slower pedestrians. However, most parts of the United States are dominated by low density, auto-oriented landscapes where there are few pedestrians, and sidewalks, if they exist, are usually empty. In these areas, skateboarders could take advantage of underutilized sidewalks that connect destinations too far apart for walking. As roads and sidewalks shift between more and less conducive to skateboarding in different situations, picking facilities where skateboarders should always or never ride is probably the wrong approach. Instead, policymakers should ask, how should skateboarders ride? How should skateboarders act around others? How should others act around skateboarders? A few universities use these questions to shape skateboard policy. San Jose State University’s “Common Courtesy” rules and a package of rules at UC Riverside specify when skateboarders should yield or slow down around pedestrians, and restrict skateboarding on places like railings and benches where tricks rather than travel are likely to occur. While skateboarding is probably not on its way to becoming a dominant mode of travel, skateboard travelers are out there, enjoying the unique combination of benefits that skateboarding provides and demonstrating that not every innovation in transportation requires new technology. Legality is a roadblock in many places, reinforced by perceptions of recreational skateboarding and policies inconsistent with how other modes are treated. For cities following the complete streets framework of accommodating all users, such unequal treatment is problematic. Planners and regulators must always grapple with the question of how to incorporate new modes, and skateboards might just be the leading edge of a wave of emerging micro-mobility devices that attempt to fill in a niche between walking and bicycling. As new individual transportation options such as electric skateboards, electric scooters, e-unicycles, and hoverboards roll onto the scene, the future of multimodal transportation is only becoming more complex, and will require fair consideration for all travelers. Fang, K. (2015). Skateboarding for transportation by the numbers: Quantitative indications of use of skateboards as a means of active travel. Proceedings of the 95th Transportation Research Board Annual Meeting. Washington, D.C.
Fang, K. (2015). Skateboarding as a legal travel mode: Review of regulations in California cities and college campuses. Proceedings of the 93rd Transportation Research Board Annual Meeting. Washington, D.C.
Dr. Fang is an assistant professor of geography, environment, and planning at Sonoma State University and a graduate of the transportation technology and policy program at the UC Davis Institute of Transportation Studies.